The complete Women’s Competition at the 2014 Australian Amateur Bodybuilding Grand Prix, from every round of the PREJUDGING for each class through to the CLASS AWARDS and 3 PRO QUALIFIER AWARDS. Melbourne Convention & Exhibition Centre, VIC. Australia. March 7-8, 2014. A Tony Doherty Production as part of FitX – Sport & Fitness Expo 2014. See the complete Women’s Competition at the 2014 Australian Amateur Bodybuilding Grand Prix, from every round of the PREJUDGING for each class through to the CLASS AWARDS and 3 PRO QUALIFIER AWARDS. Nothing from the contest has been omitted. COMPLETE INDEX OF DVDs FROM AUSTRALIAN GRAND PRIX EVENTS. 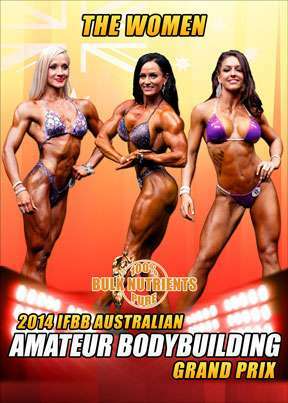 COMPLETE 2014 IFBB AUSTRALIAN PRO GRAND PRIX RESULTS.